I’m so predictable. As I started this post on bockwurst, I got the idea to see if I’d written about it last summer. As I suspected, I had, and – get this – on the very same day, September 2. I have to laugh, but it is indeed true that I love these pale chubby sausages with just a little zing, and always have a couple stashed in the freezer for those nights when I get home and need something easy. I sauté mine in a little oil, but they grill well too. I make sure to slash them lightly or I think they might explode, so juicy are they. On a recent visit to the Amish market, where I buy these, the lady behind the counter told me, when I aked about the difference, that the bratwurst was the same thing as the bockwurst, only the bratwurst had been cooked. So I also bought a bratwurst and tried that at home. Frankly, it seemed quite different to me, and I far prefer the bockwurst. But one man’s wurst is another man’s…well, you know. 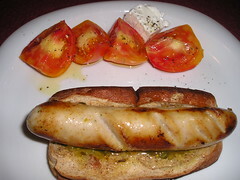 When I went to research these at Wikipedia (sausages are one of my last culinary frontiers), there were a dizzying array of German sausages, and frankly, the one I found that looked like my white bockwurst was called Weisswurst (and, wow, that is seasoned with mace, ginger, and cardamom, who knew?). Their photo of bockwurst looked like a hot dog to me, much more colorful than what I purchase. Surely this is a food where there are countless regional, and village specialties! This one went on one of Trader Joe’s good whole wheat hot dog buns (New England style, with split sides, than you very much) with mustard and relish. Add a nice heirloom tomato from the Whole Earth Center and some goat/sheep feta cheese, and I’m a happy summer camper. faith-I really enjoyed this post. I used to buy these at heinz butcher in hamilton and they were “summer sausage.” In Rockville ,Md they were weisswurst. The Trenton Farmers Market has wonderful ones (bockwurst)which I think are all veal, not veal and pork. They are hugeand,yes, they do explode. Thank you Cindy! I have bought Loeffler’s thin summer sausage in the supermarkets, and like those, too. At the Trenton Farmer’s Market, Cartlidge’s meats is now owned by the Amish, and I wonder if it is the same owners as at Kingston Amish Market. Or do you buy bockwurst there at Pulaski meats? I’ve gone to Pulaski for years. Their homemade potato pierogie are delicious, especially sauteed with lots of onions!! (and I like them with sour cream) Loeffler’s are good too, but Pulaski’s are huge! Last post on this, I promise. I forgot to say that the german friend who introduced me to them taught me to eat them with a drizzle of ketchup with curry powder sprinkled to top. Amazing!! !